THE STORY - In December 1970, rock 'n' roll icon Elvis Presley (Michael Shannon) travels to the White House to request a meeting with President Richard Nixon (Kevin Spacey). THE BAD - Kevin Spacey is barely in the movie and it takes the film longer than it should to have the two finally meet. Lacks any real resonance. Amazon Studios has come roaring out of the gate with what should've been an interesting look at two historical figures and the historical meeting that took place between them. Instead, "Elvis & Nixon" is the telling of the unremarkable meeting between two historical figures which will not succeed in being remembered years from now. It's a misguided (Yet well-intentioned) film that has very little of importance to say and seems more concerned about giving two excellent actors the opportunity to share the screen. And although that climatic meeting is the highlight of the film, the woeful miscasting continues to distract rather than enthrall. Inspired by the most requested photo from the National Archives, "Elvis & Nixon" takes place in the 1970's when America was changing. Rock superstar Elvis Presley (Michael Shannon), notices this change and is not satisfied with the status of the country's youth and their rebellious nature through protests and drug use. He gets the idea that in order to best serve his country, he must become a federal agent ("At large") and infiltrate the communists in order to restore balance to the country he loves. He travels to Washington D.C. and personally demands a meeting with then President Richard M. Nixon (Kevin Spacey). The President denies the meeting, yet Elvis is persistent. Due to the collaboration of his good friend Jerry Schilling (Alex Pettyfer) and some of Nixon's close constituents such as Egil Krogh (Colin Hanks) and Dwight Chapin (Evan peters), the meeting is finally set up. Once together in the oval office, the two megastars of the United States realize they have more in common than they previously thought. "Elvis & Nixon" is a missed opportunity on many levels but let us start with the casting first. For a film called "Elvis & Nixon," Kevin Spacey is noticeably absent from the first two thirds of this film. This is Michael Shannon's film for the most part and although he does his best to inhabit the qualities of Elvis Presley within his performance, it still manages to be bland and boring. It certainly does not help that Shannon looks and sounds nothing like the real Elvis. This is a problem that is highlighted when he gets approached in the airport by Elvis impersonators who could have passed off as the real man. Shannon comes alive more when he is acting against Kevin Spacey in the film's final third, but by that point, it's too late. And as far as Spacey goes, his Richard Nixon is a better portrayal than Shannon's Elvis, but still gets bogged down by the unfair comparisons to his famous portrayal of fictional President Frank Underwood on "House Of Cards." The other area that "Elvis & Nixon" falters is within its screenplay which fails to add anything meaningful to the proceedings. There is no underlying message within the film that is relevant to today's society or adds to the film's replay value. There is a theme that explores the nature of celebrity and how people react around President Nixon and Elvis Presley (And even how the two react to each other), but that's about it. For a film lacking in so much, it at least has the decency to keep the running time down to a merciful 86 minutes. 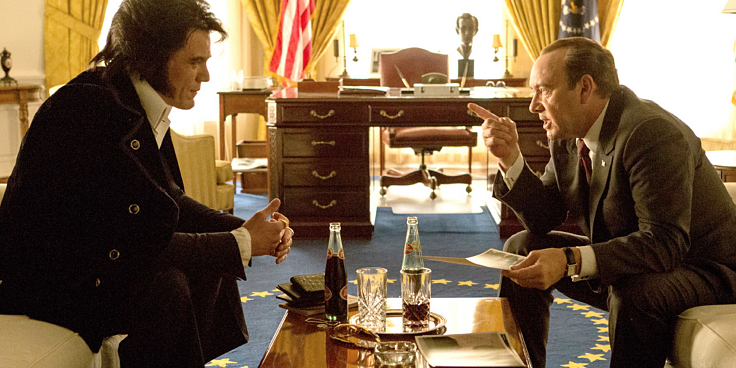 And as stated before, when Elvis and Nixon finally do come together, the quality of the film does kick up a notch, but it's let down once again by a paint by the numbers screenplay that should've embellished on the eventual meeting between the two in a more thoughtful and entertaining manner. It's odd when the supporting characters within a film titled "Elvis & Nixon" serve as the most interesting characters within the film. A fascinating story would have been following these side characters and their interactions and observations to the eventual meeting, this way that focused theme of "celebrity" would have been highlighted even more. As it stands, "Elvis & Nixon" is not necessarily a terrible film. Just an unremarkable one marked by misguided casting and an unfulfilling screenplay which had potential, but wasted it.